Molasses, spice, chocolate and pure raisins define this as classic P.X. It’s syrupy but not too much so, with maple, cinnamon and brown sugar flavors. For a sweet and candied dessert wine, it has excellent balance and persistence. A star among many in this category; these wines are hard not to like. The name tells you all about this wine’s origin: this sweet young wine is obtained through drying the Pedro Ximenez grapes on mats in the sun. The best way of bringing intense Andalusian summer sun to your table. Clean, light and superbly stylish, it is a pure raisin wine that combines a full aroma with a pleasant fruitiness. Rich in dried fruit nuances and toasty hints of skins, with fresh overtones, rosemary honey. Unctuous palate. Nice partner for blue cheese, pastry and sweetmeats. It can also be served as a dessert itself or with ice or soda as a cooling delicious drink. 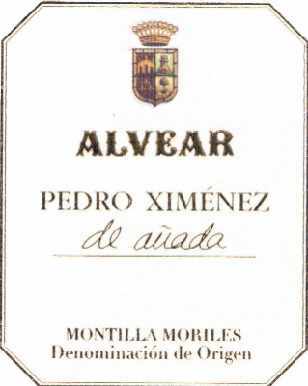 Alvear S.A. was established by Don Diego de Alvear in 1729, and since that time has remained under control of the Alvear family. This is the oldest winery in the region and its fino is today one of the three most popular fino wines in Spain . Located in the town of Montilla, in the province of Cordoba , in the interior of Andalucia. Grapes are sourced from their own vineyards, of 307.2 acres. They also buy grapes and wines from local growers. The area is dominated by small parcels. The terrain is formed by undulating hills and slopes of a singular whitish color. There are two basic types of soil: Albero and Arenas. Albero is a whitish, chalky soil, found on the higher ground in the Sierra de Montilla and Moriles Alto, both of which are classified as superior zones and produce finos of good, clean character. This type of soil is highly absorbent and can supply the vines with needed water during the long, dry summers. The sun bakes the surface to a hard crust, reflecting the heat and preventing the moisture from evaporating. Arenas is found in the Ruedos made up of largely sand, with some stony clay and a small proportion of limestone. The climate is Southern continental, with hot summers, reaching at times temperatures of 120°F, resulting in early harvests. The temperature drops sharply at night, cooling the fermenting musts. Winters are cold.